The recipe for a tripel is simple, it’s almost the equivalent of the “recipe” for scrambled eggs. However, as with preparing eggs, success lies in the freshness of the ingredients and in the details of the preparation. When brewing a tripel, your main task on brewday is to make a highly fermentable wort. 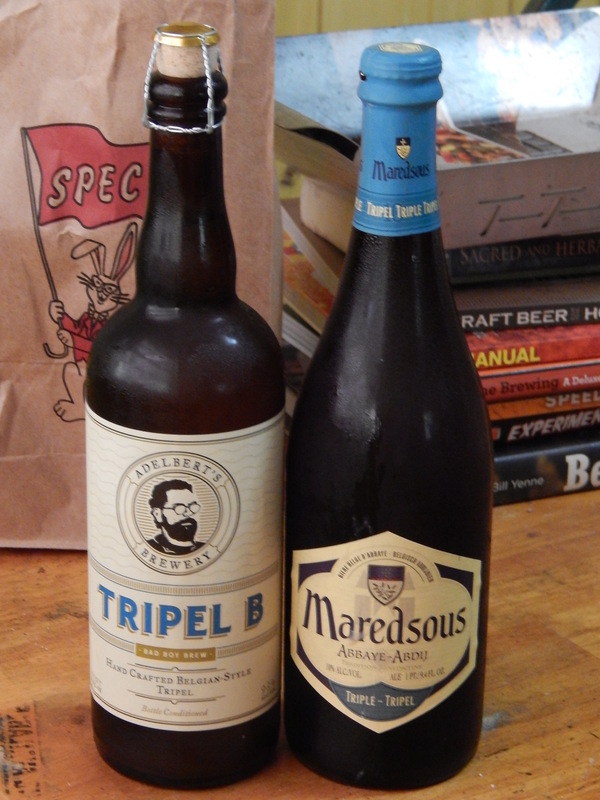 A typical tripel recipe will include mostly or solely base malts, along with some simple sugar as an adjunct. The scarcity or absence of specialty malts, and the inclusion of 100% fermentable sugar as a kettle adjunct, already guarantees that the fermentability of the wort will be relatively high. The details of your mash program will determine exactly how fermentable the wort you produce will be. The simplest mash that would yield acceptable results would be a single-infusion mash in the 146–150 °F (63–66 °C) range, at a “normal” mash thickness of 1.25–1.5 qts./lb. (2.6–3.1 L/kg). Hold the mash at this temperature for at least 60 minutes, and perhaps as long as 90 minutes if mashing at the lowest temperatures in this range. Also, stir the mash frequently (assuming you can do so without losing heat). This will give the enzymes plenty of opportunity to work on the carbohydrates in suspension. A mash regime that would yield an even more highly fermentable wort would be a step mash. A two-step mash — with an initial rest in the 140–145 °F (60–63 °C) range and a second rest in the 150–153 °F (66–67 °C) range — would work well. The low-temperature rest could last from 15 to 30 minutes, with a longer rest making for a more fermentable wort. The final rest would extend the mash to a full 60 minutes, or perhaps 90 minutes. Frequent stirring would help. A mash thickness around 1.5–2.0 qts./lb. (3.1–4.2 L/kg) will make the step mash easier to perform. If you can’t heat your lauter tun, remember that you can mash in your kettle, then scoop the mash to your lauter tun after you mash out. Temperature, stirring, and time all play a role in developing a highly fermentable wort. Don’t rush through wort production because it seems easy to simply mash pale malt by itself. Vigorously boil the wort to reduce the volume to your batch size. Be sure to boil at least 60 minutes. Wait until the hot break appears before adding your hops, and boil these for the final 60 minutes of boil. If the hot break is not large and fluffy, add approximately 50 ppm calcium ions to the wort in the form of calcium chloride or calcium sulfate (gypsum). (For a 5.0-gallon (19-L) batch, this is about a teaspoon of calcium chloride or calcium sulfate.) In the final 10 minutes of the boil, ladle boiling wort out of the kettle into the sugar to dissolve it before adding the sugar to the kettle. Stir so that lumps of sugar don’t settle to the bottom and scorch. You can add the sugar in shifts, if this helps. A tripel is a light colored beer, but it still benefits from a good, hard boil. Do not simmer the wort with the idea that you’ll darken it too much by boiling vigorously. A very light colored wort will be produced, even after a vigorous 90-minutes boil, presuming no specialty malts are in the grist and you don’t scorch the sugar. After the boil, cool the wort quickly. In the next installment of this series, I’ll discuss the fermentation of a tripel.